Build and fit quality is good but the smart view 'always on' window only displays for about 10 seconds and shuts off. Not as described and defeats the purpose of the smart screen cover. Must still open cover to see weather, notifications etc. Received quickly. Exactly as described. Genuine Huawei Smart View flip case. Fits perfectly the P20 Pro model. Beautiful design. Excellent communication with MobileFun Service team. I recommend both this product and MobileFun for anything mobile related! This is an excellent protective case / cover. Would certainly recommend it. Was delivered as ordered the first time. That was after two unsuccessful orders from other suppliers, for the same thing. Because it was an overseas delivery they said it would take a little longer, but it was not that long. Smart looking case with conveniences. As described. I llike the side window of the case and you don't have to Open the case cover to answer call. Does exactly what it supposed to - protect the phone. Love the side bar showing the time & step. Good buy for me. Does the job but would like some type of fastening on it. Looks expensive and feels good. 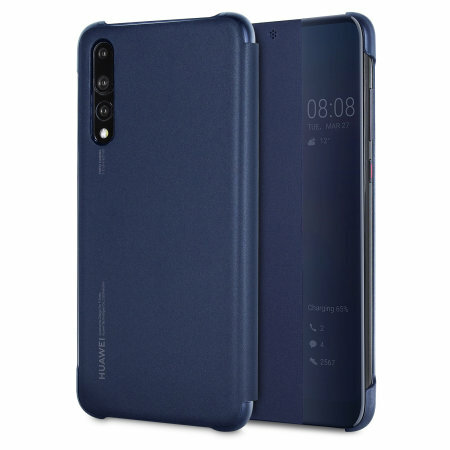 The case is excellent, an essential item for the huawei p20 pro. So glad i bought it, now my phone is safe, and i can still see the time etc, through the clear section, perfect, and good value. Seriously? I think it just makes sense for the cover to stick to the screen when you close it. Instead it just flops around. A cover is meant to protect the phone. Case is fantastic, third case I have bought since August, first one broke fairly easily, second one, although provides good protection is HUGE, then seen this. Keeps the phone nice and neat, and like the smart feature which allows you to answer calls while closed. Purchased the equivalent case for my son's Mate 20 pro on the back of this. Great product, easy website to navigate and speedy delivery :)! I was hoping that this case would provide better grippiness and all around protection than the case I already had. I'm not sure that it does. The sides are exposed, it feels thin and not particularly grippy. The see-through screen is much cloudier/darker than I like. Also, I find the flap annoying for taking pictures. Everything was just as indicated on the website. Cover fits perfectly and arrived within days. Absolutely delighted and nothing negative to say at all???? Beautiful navy. So smooth and great quality. Does everything the seller promised..
Not impressed with this case. This case isn't very responsive for answering calls, had one for the pro 10 which was much better. Not using it at the moment. Not very impressed. Happy with the case. Only minor thing is to make the date and time show through the clear piece on the front the flap needs to be shut firmly on the phone. Not a huge thing. Really happy with this wallet as it is strong and hardwearing but does not interfere with my ability to use the phone quickly and easily. Good looking case, fits perfectly but the case doesn't fastern so flaps open easily leaving screen in protected. I would go for once that is secure in the future! The case fits the phone like a glove it's perfect. Great case perfect fit and you can take calls with it closed. Good quality, proper fitting and stylish product. Also light in weight. I love my new smart view flip case for Huawei P20 Pro mobile. All and more than I expected - great product. Love this flip case. Stylish, strong, functional. MMMM mixed review from me. This case fits like a glove and looks great. As others have said the viewing window is blurred and only shows the time and date for a few minutes which I found very disappointing as I had the impression that this information was displayed all of the time. . The case does turn the screen on and off which is handy. Otherwise this is a great case, looks good and hopefully offers some protection from falls etc. Due to the issues that I have noted I'm not 100per cent that this case is worth so much more that other available cases on the market. It’s a very good case though I excepted something with a softer leathery feel to it. Happy little case but tough.. seems to be coping well in my bag and my phone is staying protected.. love it ???? This case fits the pro20 very well, is good looking and well made. How long it will last I can't tell of course, is it worth the money, in my opinion yes it is. Perfect fit for phone. Like the clear panel which shows the time when closed. Excellent service as always from Mobile Fun. The case fits the phone well, and my phone has remained secure since fitting it. Being able to read the time through the cover is particularly useful, and a number of people have commented on the sleek appearance of the product. Lives up to & beyond all expectations. If ever there was a "thinking" phone case... this is it!!! Needed a case for my phone. This one came out towards the top of my search list. Seemed good value so ordered. Does what it's meant to. Only thing I would say is if wanting next day delivery read the delivery options very carefully. I missed the next working day line do ended up paying for delivery thinking I would get it next day. It was a weekend do not classed as a working day so missed out on this. Good service otherwise. I'm really pleased with this case, obviously being a Huawei it was bound to fit but the fact that it works with the phones technology so the facial recognition unlocks the phone when I open the case is really great. Without exception the BEST phone case I have ever had!!! As I close it the phone goes to sleep but the time is still visible at a glance... truly brilliant!!!! It looks like it belongs, clips on and disappears. This genuine Huawei case looks sleek, and the Smart View window provides the ability to see important notifications to a degree. However, the usefulness of this in practice is limited, given the smoked screen reduces the visibility. The cover occludes the notification LED, which is disappointing, especially as it is a genuine OEM product. The thing that really lets this item down is the limited protection it affords. Sure, the corners are shielded, but the cutaways at the top and bottom dramatically reduce the shielding to the edges and screen. This becomes a problem if the phone is dropped, as the flip cover has a distinct tendency to open on the descent, leaving the screen entirely exposed. In short, it looks good but gives little assurance that your precious P20 Pro will survive any inadvertent tumble. Great case, just has described. Case fits the P20 Pro perfectly and the flip view cover works great. Like how when you open and close the cover, the phone's screen turns on and off. Good product, as described. Was delivered really quickly. Really nice, slim phone case. Protects my mobile intelligently and is a pleasure to hold. Great case, can't fault it. Price and delivery were spot on. Very nice looking and feel but the plastic window for the time display is too dark. Also leaves a vertical mark on the screen (I don't know why). OK but expected better being Huawei genuine. Delivered within the time frame given and arrived well packaged and in good condition. The case is really well designed and enhances the look of the phone. It fits the phone beautifully without having to excerpt any force on the phone when fitting the case. The apertures for side buttons, speakers, charging point and camera lenses are all extremely accurately placed and the case is tactile and does not add bulk to the phone. Yes, the polished surface strip on the front face of the case does attract finger prints if your fingers are oily but they soon wipe off with a micro fibre cloth and it isn't a problem as you'd have to clean your phone screen anyway. The case gives great protection as I have a habit of chucking it in my bag with my car keys, house keys etc and there's not a mark on the case so far! I'm happy with it, saved my phone from a few knocks. Easy to fit n use. After a week the time disappeared from showing in the side window, pretty disappointed really. Looks smart and swipe call feature is good. This is an Excellent case for the Huawei. It fits like a glove. looks and feels sleek, I love the fact you can answer a call while the cover is still closed ! I would have liked to have seen more reviews from customers, I always review a product before I buy. I would also have liked to know if it came in different colours. Other than that a great product ! Good strong flip case. View panel is a nice touch. Knew what I was buying. Looks great on the phone and like the way the phone can be answered with the cover closed. Looked at non branded cases but am happy that I went with the genuine Huawei article. The delivered product fully met my expectations. Quality at fair price. Just what I needed and it is great that you can take calls without having to open the case. Looks great feels light, can't say how it survives been dropped but will let you know when I do! The case was as described fitted into case with no issues even with glass screen protector on. Side panel window is a great idea and saves a lot of dirt grease etc getting onto phone. Highly recommend. Fits perfectly and looks fantastic, really does compliment an already amazing phone! It's a really stylish and robust case that offers the phone a lot of protection. Great fit and a non slip texture. The case fits perfectly and doesn't add bulk to the phone. If you want the ultimate protection then look elsewhere as there's not a great deal of padding. The semi transparent panel is a great idea. Genuine Huawei case so it fits well. Looks good too. Would recommend to anyone who doesn’t want a non branded case. Wanted an official case for my P20 Pro, this fits the bill exactly, great case, like the way you can answer calls without opening case. Good cover, happy with it. My last phone was the P10 Plus and I got the Huawei from cover for that phone, it did a very good job of protecting the P10. I ordered what I thought would be the the same cover but a little larger, wrong, this new case is firm but so tactile and easy to grip, no fabric just smooth plastic. I am really impressed with this case. I have also put on a screen protector. Wanted to have the official cover for my new P20Pro. This arrived a few days after the phone was released. The cover was exactly what I wanted. I've had the case for a week now and quite like it. The smart view feature is good and shows the time and number of steps etc when a button is pressed. It feels great in the hand and the cover doesnt lift up when the phone is laid flat. Feels much better quality than my official Samsung flip case. The cover of course obscures the camera when it is open but that's as expected for a case like this. My only gripe is that I noticed a weird smudge down the front of the screen where the smart view plastic joins the case. It took me a bit to realise what was chasing it as it looked like water had got under the screen protector but after a firm rub with a cloth of a sleave the line vanished. Can you please contact our Customer Services team so we can look into this for you. Sounds very strange you are having issues.